How do I install or update MailCheck? Where does MailCheck save its settings and how can I save it, eg to transfer it to another computer? How does the spam filter work and what do I have to enter there? Why does my virus scanner report a virus or a Trojan? Why is MailCheck still displaying my messages even though I have retrieved them with my email program? 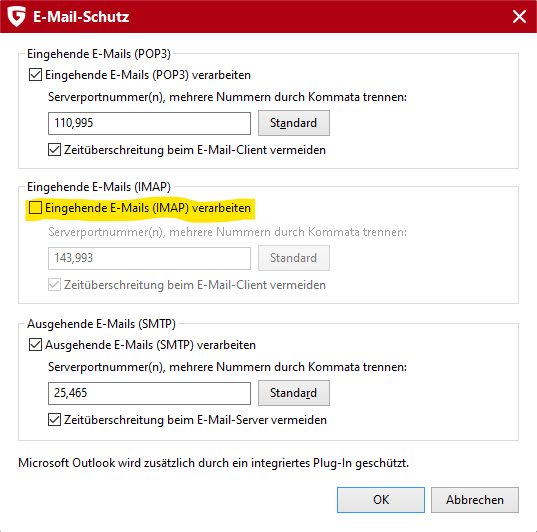 How can I enter the Mail App as an e-mail program under Windows 10? MailCheck can not retrieve my messages and I always get a red exclamation mark. What can I do? Why can't I retrieve my messages from T-Online? Why can't I retrieve my messages from Google? Why can't I retrieve my messages from GMX? Why can't I retrieve my messages from Yahoo? Why isn't the message retrieval working even though I set up everything correctly? Question: How do I install or update MailCheck? Answer: During the initial installation, the installation program asks if a "normal" or "portable" installation should be performed. In most cases, the normal installation is the better way, since the normal installation contains a function for creating a portable version, which takes over all settings from the normal installation. If a normal installation already exists, the installer will update it without asking many questions. All settings are retained. For an update, you do not need to uninstall before. Even a portable installation can be updated with the installation program. Since MailCheck does not save any settings in Windows for the portable version, the user must manually select the installation directory. However, you should not mix the normal and portable version, otherwise there are problems with the settings. Question: Where does MailCheck save its settings and how can I save it, eg to transfer it to another computer? Answer: The settings can be easily saved via the menu item "Export settings ..." from the file menu of the MailCheck window. This creates a registry file that can be imported just as easily. Use the menu item "Import settings ...". Experts can also find the settings in the registry under the key HKEY_CURRENT_USER\Software\Dirk Jansen\MailCheck. The portable version stores the settings in the mailcheck.ini file located in the program directory. This file also controls whether MailCheck is started as a normal or portable version, so if this INI file is present, MailCheck starts as a portable version. Question: How does the spam filter work and what do I have to enter there? Answer: MailCheck's spam filter uses what are known as DNS-based filter lists, which do not filter using e-mail addresses which can be easily forged, but use lists of e-mail servers that are known to send spam. 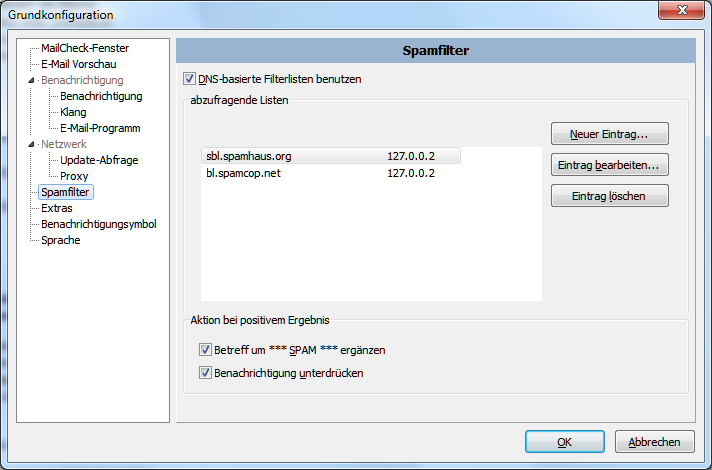 Two recommended lists are those accessible via the domains sbl.spamhaus.org and bl.spamcop.net and both return 127.0.0.2 as a result. Question: Why does my virus scanner report a virus or a Trojan? Answer: Prior to the release of a new version, MailCheck's installation archive will be reviewed on the www.virustotal.com site with more than 50 virus scanners, so it is very likely a false alarm. You can even upload the affected file to virustotal and have it checked with the latest signatures. If only your virus scanner sounds the alarm, you should send the file to your antivirus vendor for further analysis with a request to update their virus signatures. For example, Avira offers an appropriate form here. Question: Why is MailCheck still displaying my messages even though I have retrieved them with my email program? Move the messages in your e-mail program from the Inbox to another folder. This can be another folder on the server (works only with IMAP) or a local folder on your hard disk. MailCheck will no longer display these messages after the next query. In MailCheck, select the option Hide e-mails already marked as seen under "Edit server" in the "IMAP4 Options" tab. Then the Inbox is retrieved with a filter, ie e-mails marked as read are not retrieved by MailCheck and thus no longer displayed. There are some broken servers that mark messages as read on the server after MailCheck's query. You notice this wrongdoing of the servers when MailCheck displays the Inbox as completely empty after the second poll. Unfortunately, you will have to deactivate this option again. Question: How can I enter the Mail App as an e-mail program under Windows 10? Question: MailCheck can not retrieve my messages and I always get a red exclamation mark. What can I do? Answer: MailCheck displays an error message in the MailCheck window in the server list under Status in case of error. This error message often also contains the exact answer of the server and gives hints to the fix. A detailed error log can be called up via the context menu of the entry. Click the right mouse button on the entry and then on 'Show error details...'. Question: Why can't I retrieve my messages from T-Online? Answer: T-Online allows the retrieval by foreign e-mail programs only after explicit activation. Answer: Google enforces an advanced login process on email accounts that MailCheck does not support. You have to deactivate this extended procedure here. To do this, set the option "Allow less secure apps" to "on". In the description, Google gives the impression that this makes access to the Google Account unsafe. However, the login process will only be set to the default username/password method that all other email providers use. Alternatively, you can also generate an app password. This generates a separate password for MailCheck. Instructions can be found here. Question: Why can't I retrieve my messages from GMX? 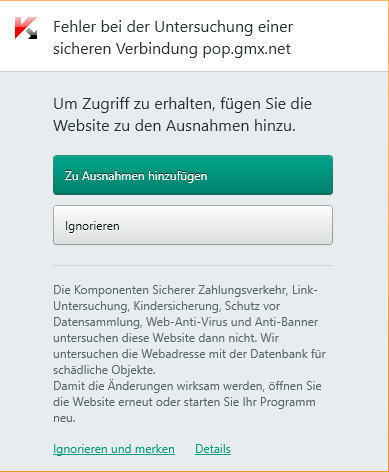 Answer: With GMX, the querying must be explicitly enabled for POP3 and IMAP. Details can be found here. Question: Why can't I retrieve my messages from Yahoo? Answer: Yahoo enforces like Google an advanced login proecess on email accounts that MailCheck does not support. You have to deactivate this extended procedure here. To do this, set the option "Allow apps that use less secure sign in" to "on". In its help Yahoo gives the impression that this procedure should promote their own apps. Question: Why isn't the message retrieval working even though I set up everything correctly? Answer: Some virus scanners block the retrieval of encrypted messages because they can not scan them. To fix this problem, the e-mail virus scanner must be set up correctly. For this purpose the virus scanner's e-mail checking must be switched off. Screenshot how to add an exclusion for querying a server. 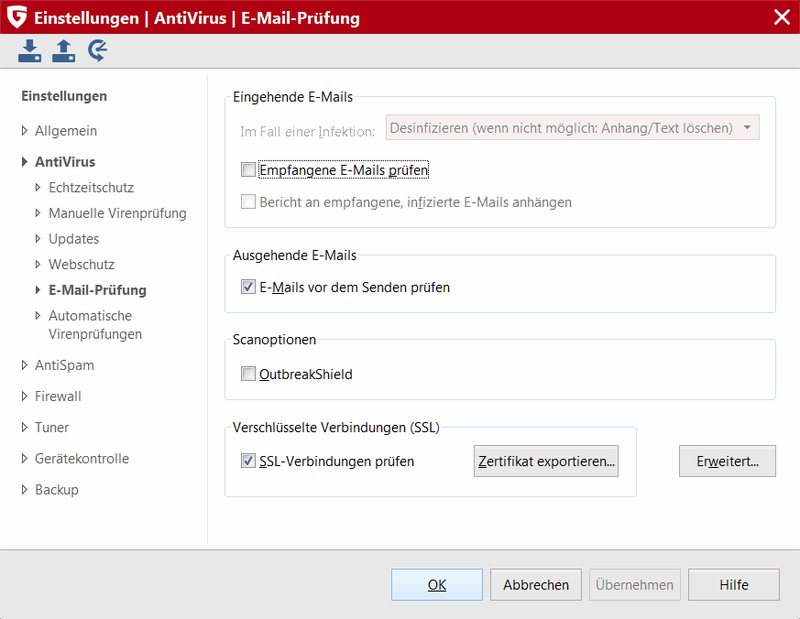 For some antivirus programs, you have to disable the certificate check in MailCheck for the retrieval to work because the programs break the SSL connection. This is strictly a man-in-the-middle attack and undermines the security of the connection. Often, the only solution is to turn off SSL certificate validation in MailCheck (via "Edit Server" in the "Protocol Settings" tab by activating the "Always accept SSL Certificate" option). This step is necessary because virus scanners only inject their self-issued certificates into more common used e-mail programs (MailCheck is unfortunately not among these programs).